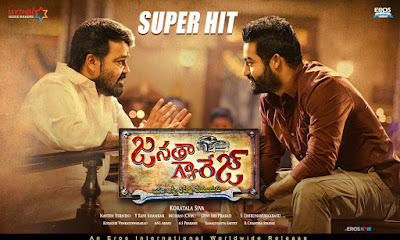 NTR-KoratalaSiva much awaited movie 'Janatha Garage' released last week with huge hype and expectations and got mixed reviews on Day1, irrespective of talk collected Record Share on Day1. The talk is improved from Day 2 and audience liked NTR-Mohanlal combination and performance, Koratala Siva executions on Social theme which resulted in Strong Hold from Day2 to Day5 without any dip in collections and becomes Fastest 60Cr movie after Baahubali thanks to long weekend. It got slight dip in collections on Day6 and Day7 but it is expected. Already it becomes NTR Career best and Holds first week Non Baahubali Record. As per the reports Janatha Garage First week Collections in AP & Nizam are around 46Cr (share) and Worldwide close to 63+Cr(share) with this it already stands in Top6 in All-time TOP Tollywood Movies List. Looking at the current trend it may join in 80Cr Club, Let see how far it goes. keep visit this space for more updates.